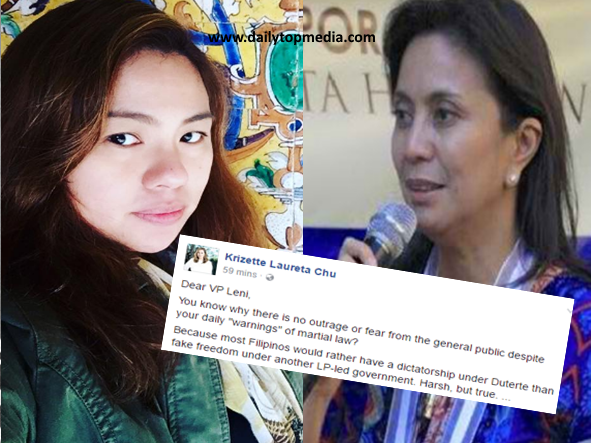 Well known writer Krizette Laureta Chu slammed Vice President Leni Robredo for asking Filipinos to remain vigilant after the remarks made by President Duterte that he wanted the constitution amended to make it less difficult for any president to declare Martial Law. Chu said that there is no fear from the general public despite Robredo daily warning of Martial law. Because most Pinoys would rather have choose dictatorship under President Rodrigo Duterte than fake freedom under Liberal Party government. She said that if Filipino people were pushed into a corner, and asked to choose between President Duterte dictatorship and an Liberal Party led government, she said that millions would jump into Duterte’s dictatorship than LP government. And yes, stop, please. All these everyday statements make you seem lamer and lamer and lamer by the minute. Use your voice for real opposition. The more you talk, the more you dilute its power. Hindi ho namin kailangan malaman ang running commentarie. Very well said, very good writer.What a shame on Robredo just keep attacking without thinking. You better help the president fix the country fast. Hats off and very well said.